Stephen Ormond – Lee Murtagh – Steve Collins Jr.
Whilst most people would automatically associate ‘Independence Day’ as an American celebration, they might have to think again if they are going to attend the Dave Murphy, in association with Acourtier Events promoted ‘Independence Day’ extravaganza at York Hall, London on Friday 5th July, as whilst yes there will be Americans fighting on the bill, by far the largest contingent is going to be Irish. What’s more two of the stars from Emerald Isles are current Champions, one a World Champ, the other is the Irish Light MiddleweightKing. That’s not all, as the third is the son of a Legendary Irish Two Time, Two Division World Champion. 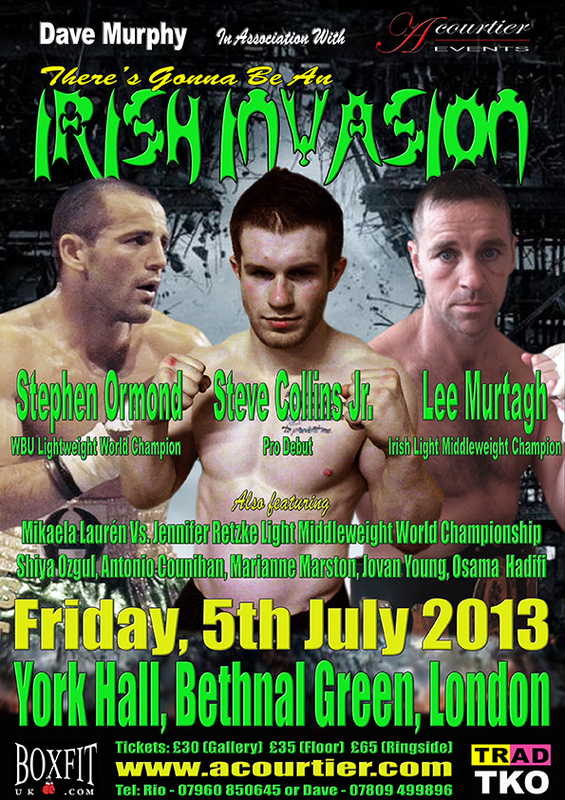 Heading up the list, from across the Irish Sea, is WBU Lightweight World Champion Stephen Ormond. Dublin’s Ormond has just the one loss, a highly controversial loss to Paul Appleby back in March 2012, when they battled it out for the BBBofC Celtic Super Featherweight title. I say highly controversial as I’m sure that anyone who watched the all war at the Braehead Arena would agree that, whilst it was a close fought affair,it was the young Irishman should have taken the laurels that night. That aside, since then Ormond has gone on to not only fight for a World title, but win it in convincing style, with a second round stoppage of Hungarian Laszio Robert Balogh just last month. On the 5th July Ormond will be taking part in an eight rounder, which is being described as a warm up for the first defense of his World title at Wembley Arena on the 25th October. Joining the esteemed Mr. Ormond is Leeds, Yorkshire basedIrish Light Middleweight Champion Lee Murtagh, who after fifty pro bouts finally gets to fight in the Capital. Murtagh, who won the coveted Irish crown back in July last year, after Joe Hillerby retired in the sixth with a dislocated shoulder, successfully defended his title, against Willie Thompson in October 2012. On the 5th July Murtagh, like Ormond, will be competing in a non-championship battle, as preparation for his next defense of the Irish Crown later this year. The third Irishman on the show comes from exemplaryblood stock, as this young man is the son of legendary two time, two division World Champion, with whom he shares the same name – Steve Collins. Not intending to make comparisons with his esteemed father, Collins Jr’s coach Paschal Collins, has favorably compared the youngster’s boxing style with that of his father, which makes this professional debut fight a truly mouthwatering prospect. What’s more Collins Jr. will be making his professional debut on July 5th, at the very weight category as his father will do when he faces Roy Jones Jr. later this year – Cruiserweight. The Irish trio will be joining a further trio of big punching knockout artists, sensationalunbeaten Light Heavyweight prospect Jovan ‘Hammer’ Young, Denmark’s Osama Hadifi, who has six wins - all by first round KO, and Woolwich Super Bantamweight Marianne ‘Golden Girl’ Marston, as well as a pair of former Amateur Super Stars, Team GB’s Antonio Counihan and London based Turk ShiyaOzgul that will making their pro debut. All of the above feature on the support card of the historic Female Light Middleweight World Championship battle between Jennifer Retzke and MikaelaLaurén that headlines the Dave Murphy, in association with Acourtier Events, promoted ‘Independence Day’ event, which takes place at York Hall in Bethnal Green, London, on Friday 5th July 2013. Tickets, priced £30 (Gallery), £35 (Ground floor standard seated) and £65 (Ringside) are available on-line at www.tkoboxoffice.com - www.mariannemarston.com -www.acourtier.com - or in person from the TRAD TKO Boxing Gym in Canning town – www.tkoboxinggym.com - and Ringtone Gym in Euston - www.ringtonehealthandfitness.com - or from any of the boxers taking part in the event, or call – 07960 850645, 07809 499896 or 07557 641597 for further information.